Michigan has Tyus Battle, Jon Teske and Austin Davis in the fold in the class of 2016, but John Beilein is still searching for his point guard of the future. With Michigan’s recruiting focus in the class of 2016 set to focus almost entirely on the point guard position, here’s a rundown of the major targets on Michigan’s board, what they bring to the table and where things stand. Michigan has Tyus Battle, Jon Teske and Austin Davis in the fold in the class of 2016, but John Beilein is still searching for his point guard of the future. Derrick Walton will be a senior when the class of 2016 arrives and Beilein has always preferred to overlap his lead guards by a class. Michigan’s remaining focus in the class of 2016 is likely to shift to the point guard position, although some top prospects like Josh Langford should remain as priority targets, here’s a rundown of the major point targets on Michigan’s board, what they bring to the table and where things stand. Winston has been the top point guard target on Michigan’s recruiting board for several months now. He’s emerged as arguably the top point guard in the Midwest and is No. 3 in the Nike EYBL in scoring at 21.3 points per game. Winston visited Ann Arbor for yet another unofficial visit on Thursday and at this point he has to be close to double-digit visits to both Michigan and Michigan State for various camps, unofficials and games. Other than Michigan and Michigan State, schools like Marquette, Iowa State, Ohio State, Harvard and Stanford are involved. He broke his wrist and will miss 6-8 weeks, but by that time frame he could still be back in time for Peach Jam in July. He has been very careful not to name a timeline or any leaders in his recruitment, but has been pretty adamant that he wants to take official visits before he makes a decision. Could that plan change? Of course, but it would be a surprise at this point. If you wanted to compare Goodin to a previous Beilein point guard, the easy answer would be Darius Morris. Goodin is a big physical guard that can use his size and strength to score and pass from the lead guard spot. His length and athleticism is a luxury on the defensive end, and would be a lethal combination with Tyus Battle in the backcourt, and he also has the size to easily pass over ball screens. Goodin, a Kentucky native, has Louisville and Florida offers with Butler, Xavier, Michigan, Ohio State and Miami among the schools most involved. He has visited Indiana, Butler, Xavier, Michigan and Ohio State. Is Huerter a true point guard? Probably not. But he might be the sort of player that you could add to the roster to bridge the gap at the point guard position while adding valuable passing ability to the backcourt in any combination. Simply put, Huerter is a guy that makes everyone else on the floor better. Prep school is a possibility for Huerter as Syracuse offered him as a class of 2017 prospect and other schools have discussed redshirting as a possibility. A move to 2017 benefits Syracuse because of its scholarship sanctions, but could also work for Michigan as well with its limited scholarship numbers. Michigan has had an in-school visit and the next step is getting Huerter on campus. Syracuse, Notre Dame, Stanford, Vanderbilt, Michigan, Georgia Tech, Maryland and Davidson are some of the other schools involved. Brown has been one of the top performers on the AAU circuit this spring and reported that Michigan wants him as a point guard — an important distinction with Battle in the fold. He’s similar in his influence of the game to someone like Russell Westbrook with his ability to control the ball, attack the basket and grab rebounds in the lane. Brown discussed a potential visit to Ann Arbor, but nothing formal was set up at the time. Texas, UNLV, Arizona, Michigan, Indiana and SMU are some of the schools recruiting Brown the hardest. Murray is an interesting case as the Canadian combo guard has discussed possibly graduating early and joining the 2015 class. But he has another option that hasn’t been brought up nearly as often: He could stay in school this season and then enter the NBA Draft straight from high school as an international prospect. Michigan has been involved in Murray’s recruitment for quite some time — and is one of the few schools that he’s visited, an unofficial for a game two years ago — but Kentucky and Oregon are considered major players in his recruitment. Murray is planning to take visits over the coming weeks, but he’s keeping things close to the vest. “We’re taking a couple visits, I’m not sure the date yet or exactly how we’re going to do it but we’ll be taking some visits for sure,” his father told Zags Blog. Aiken has the reputation of a shoot-first point guard, but he was impressive in Lexington during the second session of the Nike EYBL. John Beilein was in attendance for the game I watched, where Aiken routinely got into the lane to draw contact and get to the free throw line. He has a mature offensive game and is capable of shooting off of ball screens, but his size could be a concern. Aiken discussed a potential visit to Illinois and was recently offered by Butler, but was also very intrigued by Michigan’s pitch. Aiken plays with the same AAU program as Tyus Battle, so the Michigan coaching staff should have an opportunity to evaluate Aiken as they track Battle this July — once Battle returns from injury. 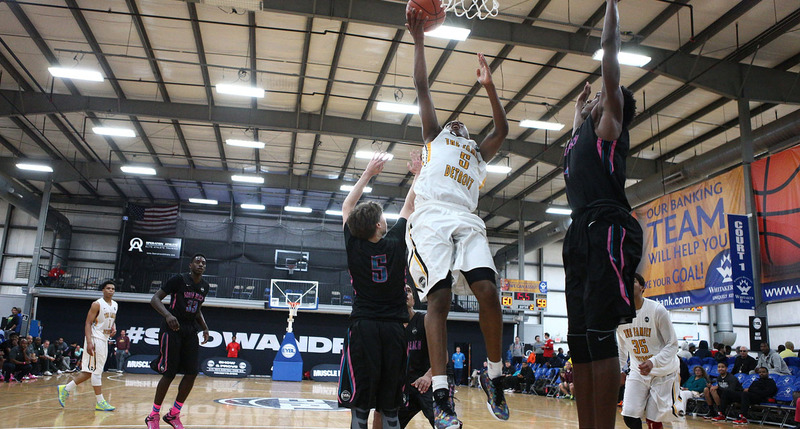 Walker emerged as a Michigan target this April as the Wolverines scouted him on the Nike EYBL circuit. The 6-foot guard decommitted from Purdue in March and has added offers from Butler, Penn State, Illinois, Missouri, Kansas State and Florida State since. He’s expected to visit Michigan in June and has been vocal about wanting an offer. Ramsey has discussed a potential Michigan visit for much of the last year, but the trip across the country from California has yet to be rescheduled after his previous visit was canceled due to an ankle injury. He’s a bit of a different mold of lead guard than Michigan’s other targets as he’s known most for his hawking on-ball defense and quickness. Ramsey’s current school list includes N.C. State, Michigan, USC, California, Florida State, Texas, Washington and Arizona State.